You know when you hear about something new several times? And you think, hmmm.... am I supposed to do something with this info? Is the universe telling me something? 1. Why I quit running (and the weight-training program I've taken up instead). But in the meantime, I've reacquainted myself with my old friend Jillian- four nights out of the past five!. I have long been a lover of her 30 Day Shred DVD. The 30 Day Shred follows a 3, 2, 1 formula (3 minutes of strength, 2 minutes of cardio, 1 minute of abs, repeated 3 times) and it a fabulous quick workout. It clocks in at about 23 minutes including the warm-up (I must admit I am a cool-down skipper). But I've got to tell you that I am loving her newer 3, 2, 1 formula DVD- Ripped in 30- even more. Ripped in 30 has 4 workouts on it, compared to 3 on 30 Day Shred. The workout clocks in at closer to 30 minutes, rather than 23. Nice to add a few minutes, but still stay a manageable length. There are 3 different moves per strength circuit as opposed to just 2. The 30 Day Shred had you doing the same strength move for 1 minute (rough!) and Ripped in 30 does each move for 30 seconds. So my plan is to continue to do Jillian while I wait for ChaLEAN to arrive. I'm also planning to run the Dallas Rock 'n Roll Half in March, which I did last year and enjoyed. I really need to concentrate on my fitness in 2012, and although I'm not making it an official resolution, I'm setting it as a priority. 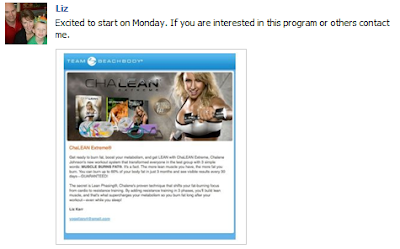 Have you tried Jillian or ChaLEAN? Any fitness goals or upcoming races for you? I have not tried ChaLean but I did do Insanity. (It is another Beach Body product.) It was INSANE but it works! Can't wait to hear how you like the ChaLean. A fellow blogger just told me to try 30 Day Shred because it was her favorite, too. I will start with that one and see how you like and compare with ChaLean! :o) Thanks for your reviews! Too funny. Chalene is from Orange County. My friend, Doris, used to work for her teaching Turbo Kick Boxing.